A higher credit score will earn you a lower interest rate with most lenders. Here's how Carrie S. Nicholson raised hers over 100 points in less than a year. A good credit score can land you your dream home without a nightmare mortgage. Generally, a higher credit score will earn you a lower interest rate with most lenders. Mortgage providers tend to consider a credit score above 700 ideal. But getting your score anywhere in the 620-850 range can save you tens of thousands of dollars in interest over the life of a 30-year fixed mortgage, according to bankrate.com. 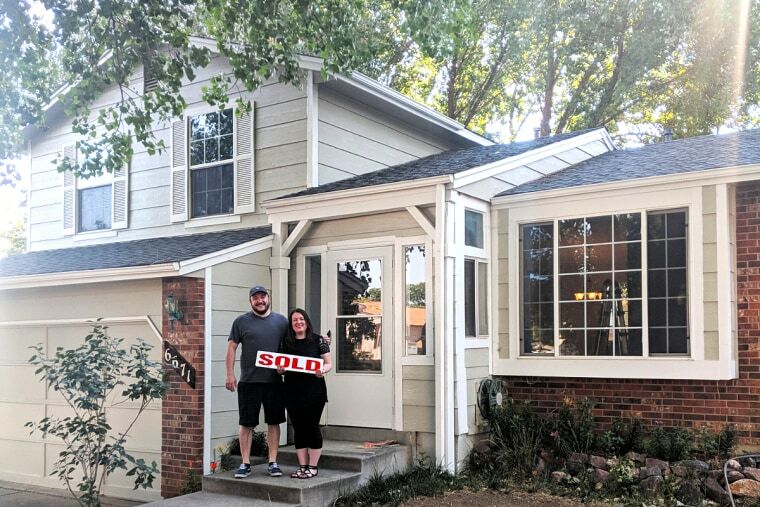 Careful Cents founder Carrie S. Nicholson achieved a 720 score that allowed her and her husband Ryan, 31, to buy their first home with an affordable mortgage rate. Nicholson, 34, boosted her credit score 100 points in less than a year. Here’s how she did it. When Nicholson began to consider purchasing a home in January, she was disappointed to see her credit score was in the low 600s. The score was good, she recalled, but not ideal. “I had some credit card debt on there, a personal loan and a car loan — so it was a good mix of different kinds of credit, which I found out was a good thing,” she said of her credit report. But her debt-to-income ratio (DTI) — the amount of debt she owed vs the income she was bringing in — wasn’t quite where she wanted it. “It was high enough where some mortgages wouldn’t give us the budget we were looking for,” Nicholson says. She says the main problem was that her credit card balances were a bit over the recommended 30 percent threshold. There were two ways she could fix her DTI: 1) Pay off as much existing debt as possible with savings and 2) request a credit line increase. Nicholson did a combination of both. On credit cards that were maxed out or had balances above 30 percent, she requested a credit line increase. She says these requests can usually be made online or over the phone with customer service. Nicholson says she also used some savings to pay down some debts. “I paid down some of the debt on the [cards] where I couldn’t get a credit line increase,” she explains. Proceed with caution. Credit line increase requests will trigger the credit card agencies to open hard inquiries into your account, which will cause a small, temporary drop to your score, Nicholson warned. But she says your score will bounce back soon. Sometimes these requests can result in a decrease to your credit limit, Nicholson adds. For both these reasons, she says, it’s best to space out the requests to keep an eye on things. “I did this over a month or two period of time, and I made sure to stretch it out so it wouldn’t be like ding-ding-ding and just slam my credit all at once,” she explains. While Nicholson worked on improving her credit score, she took a hiatus on applying for any new credit until after her house was purchased. Since applying for new credit cards and loans opens a hard inquiry into your credit report, doing so could have caused her credit score to dip. “I wanted to ensure the bank that we would not be a risk, and that we weren’t rearranging our finances and looked unstable,” she says. Paying your debts on time is the most trustworthy way of maintaining a good credit score, says Nicholson. The small business owner had already established a long history of paying her debts on time, which she says contributed to her high score. “It was really good to prove that I had a long-standing history of paying the bills on time, that my business was really secure, and that the mortgage company was willing to give us $275K loan in order to buy this house,” she says. Having a good relationship with the bank where you intend to apply for a mortgage will also help you secure a good interest rate, says Nicholson. If the bank sees that you have a history of paying back debt with them, she says, they’re more likely to give you a good deal. Before you go mortgage hunting, be sure to check your credit score at all three credit bureaus: Equifax, Experian, and TransUnion, since each agency may give you a different score. “What I found out during this whole process is that different banks and different mortgage companies check different credit boroughs, so it’s good to know,” Nicholson says. She says the bureaus can also make mistakes, so it’s important to check your report for errors. After just six months, Nicholson was surprised to see her credit score spike to 720. She says it happened much sooner than she anticipated. “It just goes to show how much you can accomplish when you’re really focused on a specific financial goal,” she says. Nicholson and her husband closed on their four-bedroom home in Colorado Springs, Colorado in July. She uses one of the bedrooms as a home office, she says, which has a beautiful view of the mountains. Request a credit line increase: Requesting a credit line increase on credit cards with high balances can boost your score. But proceed with caution: It’s best to space out these requests, since they will create a temporary dip on your score. Sometimes these requests can result in a decrease to your credit limit. If you can, use savings to pay down debts on credit cards where you cannot get an increase. Pause applying for new credit: Do not apply for any new loans or credit until your home is purchased,as doing so will open hard inquiries into your credit report. This can cause your score to dip. Show a history of paying on time: Showing a long history of paying your debts on time is the most trustworthy way of maintaining a good credit score.